During the winter storms of early 2014, a section of the railway embankment along the Charing Cross to Dover (XTD) Network Rail line, failed during intensive rainfall. This resulted in heavy traffic restrictions and reduced line speeds along this section of the track. Fairhurst were commissioned with the initial primary objective of providing an emergency temporary design at the time of site inspection. Following on from this, Fairhurst provided a consequent permanent design to facilitate the line restrictions being lifted. Fairhurst provided immediate response to the emergency closure with site attendance and on site temporary works design. The immediate response by Fairhurst facilitated the temporary stabilisation of the embankment. Furthermore, it assisted the prevention of further regression of the earthwork failure undermining the railway tracks, which would have resulted in full closure of the line. 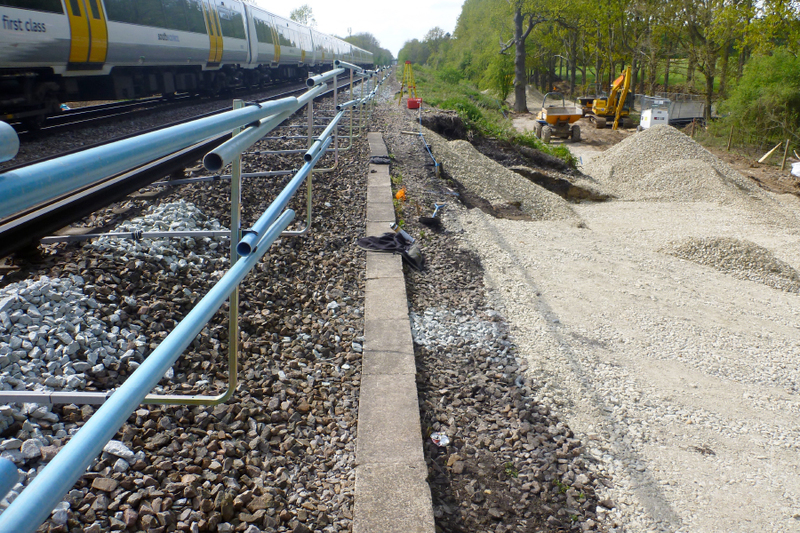 Fairhurst implemented an immediate design, resulting in the section of railway line being safely reopened, as a priority within emergency works programme expectations. Fairhurst also provided and implemented a permanent stabilisation design, targeting the causes and drivers of the initial failure. Permanent stabilisation works included the recompaction of the embankment with deep, dual purpose granular counterfort drain and rock buttresses, which act as support and provide drainage.